Design Tips for your Bathroom! Spa-like bathrooms are, of course, the ideal. Who doesn’t want to step inside their bathroom and feel immediately as if they’ve entered an oasis of light and tranquility? Most of us dream of these bathrooms. However, it’s not always feasible within the current home we’re in to completely achieve this spa dream. So what can we do to glam up the bathrooms we have? Here is some inspiration for you! Trick the eye using mirrors and lights. If we don’t have a lot of space in a bathroom (which is often the case), mirrors and good lighting are your friends. Hang mirrors that extend from the vanity all the way to the ceiling to draw the eye up and create illusions of space. Frame the mirror as well for an elegant touch that won’t cost a fortune but will improve the feel of the space immediately. Place lights on either side of the mirror over vanities. Try soft lights as opposed to fluorescents. These will reflect soothingly across the mirrors and brighten the room. Adding multiple mirrors with these soft lights nearby is especially helpful if there isn’t a lot of natural light in the bathroom (which again is often the case). Wallpaper can be a soothing addition to a bathroom, even a small one. You can stay more neutral with light, airy and solid colors. Or use patterned wallpaper instead. This can go any way that speaks to you. Blues and wavy or horizontal lines mimic water and can be lovely. Warm and natural tones are also a great way to bring in the cozy and comfort factors. But you can go outside of traditional ideas of bathrooms and use a bold black or a dramatic geometric pattern as well. Black and white in a bathroom, sometimes especially a small one looks elegant and sophisticated. Deep blues and golds and those blocky geometric shapes also work to glam up the space. Add in aesthetically pleasing accents. Think plush guest-only towels here. Fluffy towels that speak of indulgence and relaxation. But they’re actually an accent and only used when guests visit. Or what about greenery? Plants, with their lush green hues, work to naturally freshen a room that sometimes gets stale. They also bring in the outdoors and add to the spa-like vibe. You can keep your accents simple and inexpensive by using candles, warm and plush rugs and bath mats and luxurious soaps on the counter. These small additions can make any bathroom feel more restful. 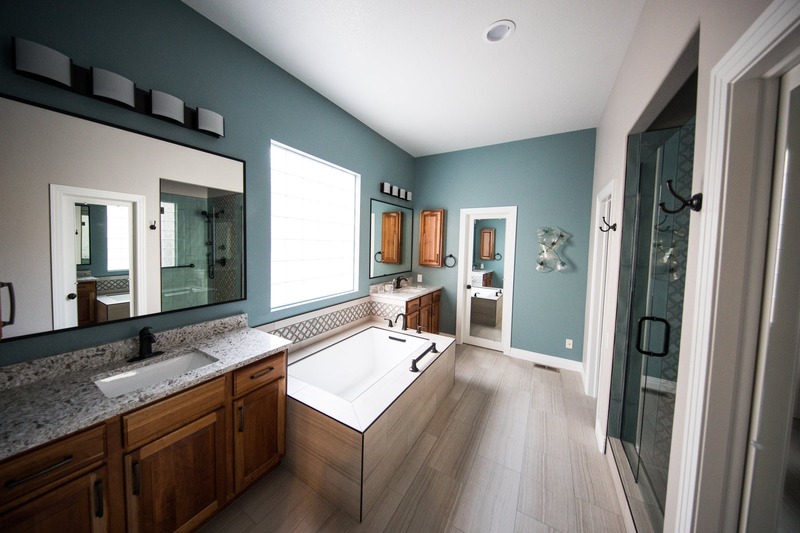 What do you think you could incorporate into your bathroom this spring to freshen it up and move towards more spa-like tranquility?